The telescopes are fixed on equatorial mounting which allows to determine the coodinetes of celestial objects with available accuracy. 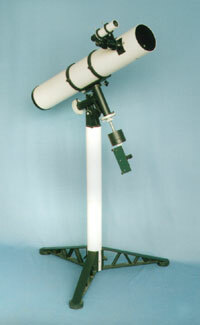 According to a customer's enqury the telescopes can be fixed on stiff pier or tripod. A stable position of tripod is provided with fixing of each supports of tripod in desirable position with the help of special stop mechanism. The telescopes are completed with finderscope with field of view of 8°. They are completed with projection screen, black (solar) light filter, two 1/25" Plossl eyepieces of f'=25 mm, f'=10mm, 2x Barlow lens, solar screen.